nuclear disaster and not from Vermont Yankee. released SR90 into the environment. Lochbaum and Chen’s separate analyses. which it can be considered safe. women and young children who eat the fish. Vermont Yankee. It must be shut down now. I have been thinking a lot lately about what happened in the first day of the nuclear accident at Fukushima. I think I have come up with some interesting information that I wanted to share with you. The facility at Fukushima was one of the largest nuclear reactors in the world. I am sure you have seen the videos of it when it was functioning and it was truly an impressive facility. Everyone has also seen the pictures of the facility after the explosions. In that period of a couple days, it went from a several billion dollar asset to a hundreds of billion dollar liability. And I believe it is the single biggest industrial accident in the history of the world. But I wanted to focus on what happened after the tsunami but before the explosions. And I think there is some important information that can be gleaned from the historical record. I need to go back and talk a little bit about the nuclear fundamentals for a minute here though. The nuclear reactor sits inside a nuclear containment. Now the containment is, we have shown before, and the one that is on the screen now, is the Brown’s Ferry Nuclear Reactor. The top of that containment has a lid on it and it is connected by many, many bolts. I am going to use a tea infuser here to explain it another way. This is the containment, the nuclear reactor sits inside, and then that lid gets screwed to the top. So that if there is an accident and a pipe breaks inside the nuclear containment, in theory, all of the contaminated gasses stay inside that containment. Well it has been known for a long time that the Mark I reactor is a very small reactor containment. As a result, back in the 80’s, the Nuclear Regulatory Commission added a vent to it. The reason for that is that engineers did not understand when they built this unit, that hydrogen gasses could build up after an accident. That is exactly what happened at Fukushima. At Fukushima the nuclear reactor was uncooled and the nuclear fuel became very hot; it reacted with the water to create hydrogen gas. Now the data from the first day of the accident is troubling to say the least. The data, as I have been able to put it together, is pretty complicated, but we will work our way through it here. This is a multi-column table. The first column is the time and the day. But what I am interested in is the fourth column over. And that table is in Pascals which is a measure of pressure. I am going to convert those to pounds per square inch which most of us are more comfortable talking about. The bottom of the table is right before the accident and the pressure was atmospheric. What that means, .1 is normal pressure, 14.5 pounds per square inch. Then the tsunami came, the plant lost it’s power, and the next data point is about 8 hours later because remember now, most of the components did not have electricity, so most of these readings were unavailable. Well at 2 in the morning, the pressure inside the containment was almost 9 times higher, that means it was about 125 pounds per square inch. This containment was not designed for 125 pounds per square inch. To look a little further though, by 9:30 in the morning the pressure starts to drop and for the next 7 hours the pressure is much lower than it was at 2 in the morning. So the question is, how could it be that the pressure in the afternoon was lower than the pressure in the early morning? Remember, there is a violent chemical reaction going on inside the nuclear reactor where all sorts of hydrogen gas is being generated. One possible reason for the lower containment pressure is that the containment vent was open. But that had not happened yet. So what made the pressure drop down? One possibility I believe to be the case, is something that happened 40 years ago at a plant called the Brunswick Plant in North Carolina. Now the nuclear industry in the U.S., the IAEA, the Japanese, are all aware of this, but they are all ignoring this test and pretending that it did not happen. What happened 40 years ago was this: When a containment was pressurized, it was pressurized to just about 100 pounds and then something really strange and unexpected happened. The top, the head of the containment, began to lift off of the bottom of the containment. Getting back to my mug here, what happened was that the bolts that hold the top to the bottom, began to stretch and the top lifted and allowed the gasses to slide out. That held the pressure in here at 100 pounds even though gasses were being pumped in. Now this was not an accident, this was pressurized with normal air, it was a test. But the containment at Brunswick began to leak at around 100 pounds per square inch. Let’s look at that table again from Fukushima. Where did Fukushima settle out at? Just about 100 pounds per square inch. What that tells me is that the head of the containment lifted up and gasses began to sneak out into the reactor building, which is that box that surrounds it, well before the containment vent was even opened. Now another photograph of the site right before the explosion, clearly shows that the containment vent was open. You will see the stack on the right of this picture and it has steam coming out the top, smoke coming out the top. What that is is highly radioactive gasses and water vapor and it is creating that steam. So we know that right before the explosion, the containment vent was working. Now the Japanese are saying that the containment vent was working, but the pipes were somehow or other leaking hydrogen into the plant as well and that is what caused the explosion. To my way of thinking, the data does not support the interpretation of the nuclear industry and the Japanese. What the data does support is the Brunswick test from 40 years ago. It seems to me that for 8 hours or more, the containment at Fukushima was basically ruptured, that the top had popped up, and gasses were sliding out, so that it could not go over 100 pounds per square inch. And hydrogen gasses were leaking out of the containment and into the reactor building for a long period of time. After that, it only took a spark to blow the reactor building up. This is a really important distinction. The nuclear industry, the Nuclear Regulatory Commission and the Japanese are saying that we can make the vent stronger so that this accident cannot happen. But if the nuclear head is lifting up, the vent is irrelevant. The containment on the Mark I design has a design flaw that the containment vent cannot solve. Whether or not the nuclear reactor containment at Fukushima maintained it’s integrity is a critical question to the operating fleet of BWR reactors throughout the world. I will be working on some more information over the next week and we will have another video up shortly. This domain is a landing page for many of you that find out about brattleboro.net by searching for Brattleboro Vermont, perhaps it is not providing the expected material. One would rightly expect information about our local businesses and attractions, how to get here, and where to stay. Links to the Chamber of Commerce or other commercial information. Sorry about that – it is a little inconvenient. Similarly, finding a nuclear power plant on the lovely banks of the Connecticut River (less than 10 miles away) is not in keeping with Vermont caricature, it is not providing the expected scene; where cows are grazing on a pasture, where small towns flourish, and artists create unique works, where small shops sell hand made items, baked goods, and good beer. The sad truth is that Entergy, owners of Vermont Yankee has cast a shadow over this town of Brattleboro and the entire region. Who would want to come and visit? Who would want to own property in the evacuation zone? How can this be a business as usual web site when our entire way of life and liberty is threatened by an out-of-state rouge corporation that sues our great homeland of Vermont and with influence, wins? How is it correct for corporations to buy our support, by donating to needy organizations? How is it ok for corporations to lie? Why is it not in our interest to look clearly at safety issues that effect our lives? 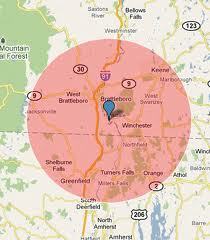 This site is dedicated to halting operation of Vermont Yankee. We take this action because of the excessive onsite radioactive waste, excessive hot water discharge into the Connecticut river and the economic dis-incentive for building a low-carbon clean-energy future. 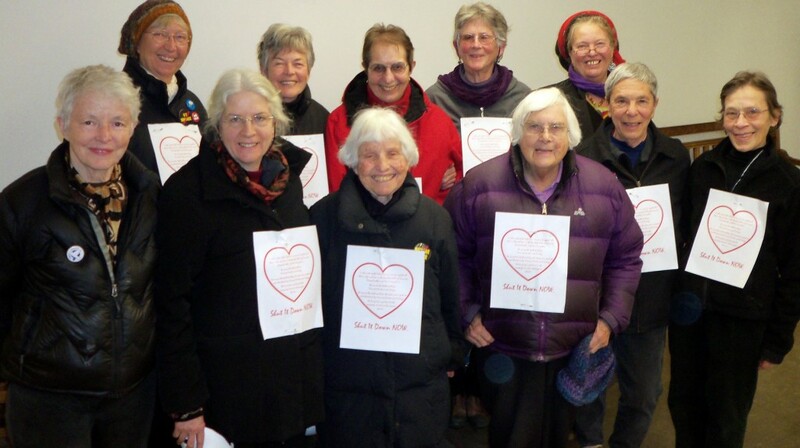 BRATTLEBORO, Vermont-Lending heart to the campaign to end nuclear power forever, the nine women of the Shut It Down Affinity Group brought a Shut It Down Valentine on Monday to the headquarters of Entergy Corporation, which operates the Vermont Yankee nuclear power plant in Vernon. Photo of Shut It Down affinity group, including, from left, front, Robin Lloyd, Martha Hennesey, Ruth Hooke (support), Hattie Nestel, and Connie Harvard; back row, Anneke Corbett, Susan Lantz, Mary-Ann Palmieri (support), Nina Swaim, and Deb Reger (support). Not pictured is Marcia Gagliardi, who took the photo.